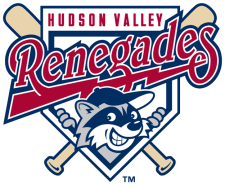 The Hudson Valley Renegades split the two game series against the State Island Yankees, losing 8-6 on Sunday at Richmond County Bank Ballpark. The Renegades big sixth inning was not enough to earn the win. Staten Island took the lead in the first inning. Eduardo Sosa led off the inning with a single to cent. Sosa stole second and would later score on a sac fly by Shane Brown to put the Yankees on top 1-0. The Yankees increased their lead in the fourth inning. Kevin Mahoney drew a walk to get things starts. Then Kelvin De Leon cleared the bases with a two run blast to put them on top 3-0. The Renegades reached the scoreboard in the sixth inning, striking for six runs in the frame. Chris Winder led off the inning with a triple. Diogenes Luis followed with an RBI single to score Winder. Luis advanced to third on a double by Derek Dietrich. Steve Tinoco singled to left, scoring Luis and moving Dietrich to third. Philip Wunderlich then delivered an RBI single to right, scoring Dietrich and moving Tinoco to second. Nicholas Scwhwaner knocked home two runs with a double to center. Wunderlich and Schwaner would then score on a error following a Burt Reynolds ground ball to second, giving the Renegades a 6-3 lead. Staten Island tied things up in the bottom of the sixth inning. De Leon went deep for the second time in the game. The three run homer tied the game at 6-6. Staten Island earned the victory in the bottom of the eighth inning. Kyle Roller doubled to center to lead off the inning. Kevin Mahoney followed with a single to third. De Leon drove home his sixth run of night with a ground out third,scoring the go ahead run. They would later get an insurance run when Jose Mojica delivered a sac fly to score Mahoney, giving them a 8-6 victory. Omar Bencomo pitched 4 2/3 innings and allowed 3 runs on 4 hits with 3 strikeouts and a walk. Kyle Ayers followed with 2 1/3 innings, allowing 3 runs on 3 hits with a strikeout and 1 walk. Hunter Hill was charged with the loss, surrendering 2 runs on 2 hits in an inning pitched. The Renegades (5-4) head to Coney Island to begin a three game series against the Brooklyn Cyclones (6-4) on Monday.